Floating mandap decoration ideas for your 2018 wedding! Your wedding mandap decoration will be one of the most significant and much-photographed part of a traditional Indian wedding. After all, this is the place where you take your pheras and the saat-vachans - the first step towards your happily ever after! With mandap decoration ideas getting better and more creative these days, it’s very natural to be swamped with all the options and what type of mandap decor to get for your own wedding. How about getting a floating mandap? Well, they are not actually floating, just surrounded by a water body like a pool or a lake around it, but looks phenomenal! Imagine a beautiful wedding mandap situated right in the middle of a water-body with its beautiful reflection in the water. Too good to be true? 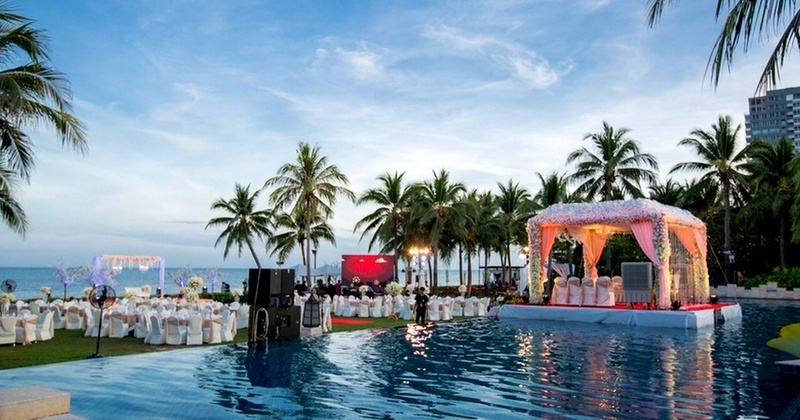 How about having a mandap right by the pool and the pool being near the beach? Yeah, I know pretty cool right? A lit fountain, candles surrounding it, chandeliers adding to the beauty of the whole surrounding and your wedding mandap right in the midst of it? One word - Phenomenal! Well if one pool won’t do the deed for you, have your mandap decorated in the middle of two pools! How about having a grand mandap right in the middle of an even more gigantic pool? It’ll make for a dreamy wedding affair! If you and your hubby are a water baby, then how about taking your pheras in a mandap right by the beach? Have a look below and I assure you, you’ll fall in love with all these mandap decor ideas! If a pool is not your thing, then have your wedding mandap set in a pond itself. P.S., perks of this mandap decoration ideas is that the you can have the gorgeous sunset as the mandap backdrop. You don’t necessarily have to go to a water body for your mandap decoration, you can have it come to you too! Totally loving this idea of filling your courtyard with water and have the mandap right in the midst of it . Okay, this is some modern decoration idea, so choose your wedding decorator wisely and you can have a similar one at your wedding too! ...because what’s better than getting married at the surreal ghat of Banaras! If you are a spiritual person, there’s nothing better than getting married near the holy waters right by your side! Always wanted to get married at a palace? Then find one that’s surrounded by a water body and have a dreamy mandap decorated by its side! It’ll give you major fairytale vibes. So, this one has a very interesting story behind it. This floating mandap is not really floating, but has enough water around it because of the rain! Apparently, it was planted right in the middle of the courtyard and has the perfect combination of orange and pink that can brighten up any dull grey day! In fact, even the flowers add to the charm as they float around the mandap and the rain continues it’s pitter-patter! Who doesn’t want such a dreamy mandap? Dreamy right? Well then what are you waiting for? Have a talk with your wedding decorator and incorporate one of these floating mandap decor ideas at your wedding!